Today's Caturday Art photo was created using Photoshop Elements 11. Disclaimer: This post includes affiliate links. Full Disclosure. 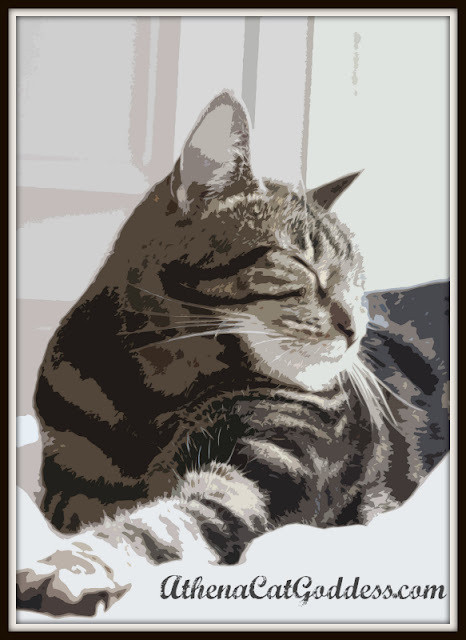 Labels: art, blog hop, blog hops, cat art, cat bloggers, cat photography, caturday, caturday art, caturday art blog hop, creative pets, pet art, pet bloggers. I love the cutout effect on this pic, Athena! Really love that effect, it is dreamy for sure! Have a wonderful Caturday Athena and Marie! Sweet photo to work with: the cut-out tool is a fun one; we love to try "coloring" the different cut out sections sometimes after using the tool ... makes for kind of an "andy warhol" look. I'm going to have to try that one. You can feel the contentment just pouring out of that cat. Hmmm, I don’t think our version of Photoshop has Cutouts but that’s a nice effect. OOOH....we need to try that too!! That's a great photo and we like the effect!! Oohhh... I'm likin' that portrait. No, I'M LOVIN' that portrait. It's a beautiful picture, for sure.